You are here: Home / Loving Nature / Dandelions – weed or not? 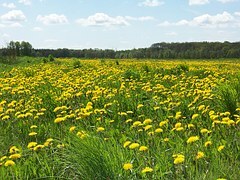 Beautiful fields of useful dandelions! Who’d have thought? Weeds, to me, have always been plants that, for whatever reason, I don’t want in my garden. This could include rampant ground covers like For-get-me-nots (myosotis) or Carpet-of-Snow (alyssum) as well as things like Dandelions. All the individual ‘petals’ on a dandelion head are actually florets, they each then go to seed, reproduce themselves without the need for pollination. Well designed to not risk becoming extinct! A toddler picking a dandelion clock and dispersing all the seeds or fairies is a delight to watch, but oh the joy of those seeds being blown on their way to land on new soil and grow to add to the dandelion crop next season! And then there’s the worry that if they do pick one – they might wet the bed… a fear terrible enough in some little ones to ensure that they do! Dandelion sandwiches were a Victorian teatime favourite. Young dandelion leaves may be added to salads and are rich in potassium and vitamin A.
Dandelion flowers can be used to make wine. Dandelion roots – well established over a few years – ground and roasted to use as caffeine free coffee. Dandelion has many uses in herbal medicine. Dandelions provide an important source of food to some larvae of butterflies and moths. Dandelions can be a good companion plant in the garden, adding minerals and nitrogen to enrich the soil. Dandelions nearby can help fruit to ripen. 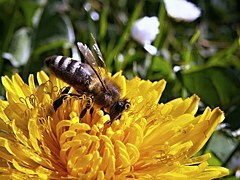 Dandelions are sought after by bees who turn it into honey. Wow, who would have thought Dandelions could be such a valuable addition to the garden! But there is a warning. The pollen may cause allergic reactions when eaten and also contact dermatitis as a result of the latex released when handled. So, the decision is yours – let us know whether you consider the Dandelion friend or foe? I will still try to keep them out of my little garden!